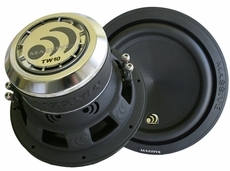 It�s time to tune your ride with Massive Audio�s New TW Tuner Series Woofers. The Massive power handling will make your music pound while the 2.5" voice coil will keep this sub cool for extended usage while providing clean tight bass. Turn your vehicle into a concert hall with our Tuner woofers that provide the perfect amount of bass. These woofers will make you feel like you are at the show. 10 inch, 500 Watts RMS / 1000 Max, Dual 4 Ohm 2.5" voice coils. PORT: 10.5" x 1.25" x 11"